The Global Volcanism Program has no activity reports for Kyejo. The Global Volcanism Program has no Weekly Reports available for Kyejo. The Global Volcanism Program has no Bulletin Reports available for Kyejo. Late-stage activity of the Kyejo (Kieyo) trachytic stratovolcano, NW of Lake Malawi (Lake Nyassa), consisted of the formation of numerous maars and cinder cones. This stratovolcano, rising to 2175 m, is elongated in a NW-SE direction and has been active since the mid-Pleistocene. Maars, some of which contain lakes, surround the Kyejo area, and young basaltic cinder cones and lava flows cover an extensive area to the south. 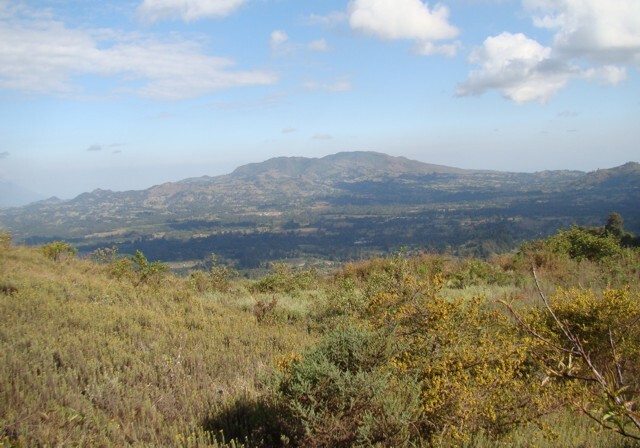 The latest eruption around 1800 CE took place from two parasitic tephritic cones, Sarabwe and Fiteko, that were constructed along a NW-trending fissure. The eruption produced lava flows that traveled 8 km and overran several villages. Fontijn K, Ernst G G J, Elburg M A, Williamson D, Abdallah E, Kwelwa S, Mbede E, Jacobs P, 2010. Holocene explosive eruptions in the Rungwe Volcanic Province, Tanzania . J. Volcanol. Geotherm. Res., 196: 91-110. Harkin D A, 1960. The Rungwe volcanics at the northern end of Lake Nyasa. Geol Surv Tanganyika Mem, 2: 1-172. There is no Deformation History data available for Kyejo. There is no Emissions History data available for Kyejo. The Kieyo volcanic complex (also spelled Kyejo) is seen from Katete, an eroded volcano located 10- 5 km NNW of Kieyo. Late-stage activity of the Kieyo trachytic stratovolcano, NW of Lake Malawi (Lake Nyassa), consisted of the formation of numerous maars and cinder cones. The latest eruption around 1800 CE took place from two parasitic tephritic cones that were constructed along a NW-trending fissure: Sarabwe and Fiteko. The eruption produced lava flows that overran several villages. Photo by Karen Fontijn, 2008 (University of Gent). Sarabwe and Fiteko pyroclastic cones, visible halfway up the flank of the Kieyo volcanic complex (also spelled Kyejo), erupted about 1800 CE, in the latest eruption in this region. The eruption from these cones formed the Sarabwe lava flow (not clear in this picture). The cones are seen from the village of Masebe near its NW foot (5 km from the summit). There are no samples for Kyejo in the Smithsonian's NMNH Department of Mineral Sciences Rock and Ore collection. Large Eruptions of Kyejo Information about large Quaternary eruptions (VEI >= 4) is cataloged in the Large Magnitude Explosive Volcanic Eruptions (LaMEVE) database of the Volcano Global Risk Identification and Analysis Project (VOGRIPA).